When I was going through my stash recently, I noticed I was sadly lacking in vintage patterns. This sorry situation had to be addressed - and quickly. So after a couple of weeks of obsessive hunting and gathering on eBay, I'm now the proud owner of this fab haul of vintage lovelies. Simplicity 4238 from 1953. I've got a hankering to sew with gingham and I think this sleeveless top would be perfect. If you can look past the grey haired old frumpsters on the front of this Maudella pattern (they're probably only about 25), it's actually a really stylish shirt dress. I'd love to sew a full skirted shirt dress, but I don't think the style suits my shape particularly. This fitted style is more more flattering. I like view 1, but I'm still pondering which fabric to use, perhaps something with a vertical stripe? Any ideas? Next is Advance 8589 from 1958. Perversely, it wasn't the boxy jacketed suit that caught my eye on this pattern (although it is lovely, just a little boxy for me). No, it's the drawstring waisted top she's wearing underneath that sang to me. It looks like a doddle to sew too, perhaps in this larger blue floral fabric? Blue flowered fabric, about to start a new life as a 1950's drawstring waisted top? I may save this Advance 9597 evening top until the Autumn to sew. In which case I'll try it in a double knit so I don't have to use a zip. View 2 is my favourite, possibly in a green. "What? ", I hear you cry, "green, not grey or navy or red?" Well, there's a sort of method to my madness. I've got strange coloured eyes - they're basically grey (which is why I like grey), but if I happen to wear green, they weirdly change colour to green, which I like very much. I don't wear green very often, but I think this pattern in a soft jersey knit may be the perfect one to introduce a bit more green into my wardrobe, and turn me green eyed at the same time of course. At this stage in my eBay binge, there was quite an overload of tops, so I slipped a classic 1972 skirt pattern in there too. In other news, I've almost finished my swing dress (yippee). I just need to insert an invisible zip (easier said than done). I hope to post pictures and a full postmortem next week. After a smattering of interest following my last crafty post, I’ve come up with a few pointers for those of you thinking of selling your handmade goods at a craft fair. I must stress, these tips are only things that have worked in my own personal experience (which is not really that extensive). My tips won’t guarantee you enormous sales or overnight craft stardom, but hopefully they will give you a good place to start if you’re thinking about selling the lovely things you’ve made. This all depends on where you live. I’ve only got experience of local events, specific to my area of West London. Look in your local paper or keep your eyes peeled for posters advertising this type of thing. Schools are quite good places to enquire too, but a lot depends on the demographics of the parents. With regards to schools, I find I do better at specific craft shopping evenings rather than school fairs. My theory is that at school fairs, parents have quite a lot of other things to spend their money on (entrance fees, games, raffles, rides, food etc) and so may not have that bit extra to spend on a handmade purse, no matter how beautifully made. What should I make and how much? This is the million dollar question and one I couldn’t find an answer to before my first craft fair. Having now done the rounds of a few, I can understand why. It’s like saying how long is a piece of string? It also depends how long the fair lasts, is it held in the evening, afternoon, all day, on a weekday, weekend, near Christmas? The list of variables is enormous. I would err on the side of caution and make more than you think you’ll need, you can always use the extra for your next fair. Make enough stock to allow for a nice looking stand, plus a few extras just in case. What you make is all down to personal taste and what you like/are able to make. I seem to make lots of things that are square shaped (cushions, lavender bags, purses, drawstring bags etc) as I find it a lot easier than sewing curves. If you find zips a bit scary, don’t make things with zips! I’ve got a zipped make-up bag I make but only in smallish quantities (6 or so) because they’re so time consuming. I find it works to have three or four smaller, lower priced items in higher quantities (15 to 20), three or four medium priced items in medium quantities (6 to 10) and a handful of maybe two higher priced items. There’s no point slaving away making a stall full of higher priced items that may not suit your clientele – give them a choice of some lower priced items as well and you may find they’ll be drawn to buy more. Here's what I sell at craft fairs. With the higher priced items, I never make more than three or four of each. At one craft fair I sold all my 1950’s aprons within minutes, at another I didn’t sell any, it just depends on who’s buying. EDIT: For additional ideas of what to sell, see this post. I’d say one of my selling points is the fabric I use, so try to offer a selection of unusual fabrics in a range of colours. Once you’ve done one or two fairs, you’ll see a pattern developing of which fabrics are the most popular, which is really useful for future planning. Without doubt, the most popular fabric I’ve ever used has been this 1970’s retro owl print. Having conducted a straw poll amongst my friends, they all agree that having a label on your product gives it a definite edge. Labels don’t have to cost a fortune, I just use school nametapes from here, and they work out at £3.99 for 72. It’s a definite talking point and people often comment on how professional a label makes your stock look. If it’s not on your booking form, contact the organisers and find out the size of your table beforehand. It’s definitely worth having a practice and setting out your stock, so you know how much room you have to play with. If your kitchen table isn’t that long, just measure out the dimensions on your bed. Tables are generally about 6ft long and vary in depth. A plain tablecloth or a couple of metres of hemmed, cheap white cotton fabric make a good backdrop. Now we come to how to set it all out. Get there early so you're not panicking about time. A good rule of thumb is don’t try and squeeze everything on to the stall as there’s a danger of it looking like a jumble sale. Sometimes less is more and people need to be able to see things properly! It’s entirely up to you if you want to label everything with an individual price or not. I tend to label things separately if there aren’t many of them or if they’re hanging from a display. For smaller items in boxes, I tend to just put a little sign on the front of the box. Little pegs with animals/butterflies on etc to peg prices onto things come in useful here. These are really cheap in pound shops. Another thing I do is have a small price list of everything for sale so buyers can see at a glance how much things are. I display this in a photo frame so it’s nice and clear and add a little sentence at the bottom, stating that I can make up bespoke items if customers wish. It’s worth getting some cheap ones made up as customers will ask for them. Vistaprint are cheap as chips and have tons of designs. Give out as many cards as you can, I put one in the bag with each sale too. People will come back to you to order things, sometimes months later. Bum bag or hands free bag – and don’t forget your float! I can’t give much advice about selling, as it’s something I’m pretty rubbish at! But I like talking to people, especially about sewing and fabric, and that’s generally all it takes a lot of the time. Don’t be disappointed if you don’t sell much, especially if it’s your first fair. You’ll find people will come back to you at a later date when they have a birthday to buy for, or if your fair is around Christmas. I had quite a lot of Christmas orders from people contacting me after the event. I’m sure I’ve left plenty of vital information out, but hopefully this is a good starting place. Good luck, enjoy yourself and brace yourself for the feeling after that first sale. Somebody has actually spent money on something you’ve put time and effort into making – it’s a good feeling! Excitement, excitement, excitement. I’ve been given not one, but TWO Stylish Blogger awards from two stylish bloggers: Kerry from Kestrel Finds and Makes and Lauren from Tea and Crumpets. Kerry is a fellow fan of Colette patterns and has made some lovely interpretations of these gorgeous patterns. Lauren is a 1940’s aficionado with a very stylish retro look. Thank you so much to both of you, I’m extremely flattered. The recipient of the award must list seven facts about themselves that readers may not know and nominate seven other stylish bloggers to receive the award. So brace yourselves…. 1. Up until the age of eight, I lived with my grandparents. Heavily influenced by my Nan’s TV watching schedule, I have an excellent working knowledge of 1970’s light entertainment and American detective shows. As a result, my favourite game to play with my cousin when I was little was Ironsides, using my doll’s pram as a wheelchair. My girlhood heart throbs? Why Michael Douglas from The Streets of San Francisco and Tim Brooke-Taylor from The Goodies of course! 2. I adore reading and would do it all day, every day, if I was allowed. I can’t imagine a life without books - to me, it’s as essential as breathing. My favourite book is A Prayer for Owen Meany by John Irving which I LOVE LOVE LOVE, I’ll read anything (apart from science fantasy) and twitch if I haven’t got a book on the go. 3. I love the colour red (though you wouldn’t immediately guess that from the amount of navy and grey clothes I’ve made!) I even got married in a long, red dress and red shoes. 4. I'm utterly sentimental about everything - even more so since I've had children - and cry at the drop of a hat. I bawled my head off all the way through my wedding service (and we only had a simple ceremony in a registry office) and had to be virtually carried out of the cinema after seeing The English Patient and then again after Brokeback Mountain. A complete and utter wuss. 5. I can juggle. Whilst sharing a house with a hippy type during my first summer at university I was bored one day, so he taught me to juggle. It’s gained me massive brownie points with my own children and anybody else’s children I happen to be babysitting. Just whip out two oranges and an apple and do a few minutes’ juggling - I guarantee they’ll hero-worship you for ever after. 6. I sleep like a log. I slept through the 1987 hurricane, even when the room next to mine had its window blasted through. 7. I have a tattoo of Tintin on my right shoulder, which I had done when I was 18. My then boyfriend and I were big Tintin fans and it seemed like a cool thing to do at the time…. Karen at Did You Make That? Ooooh, I’m famous (well, sort of). Those who’ve been reading my blog a while will know I’m a huge admirer of Tilly of Tilly and the Buttons fame. Hers was the first sewing blog I ever discovered and I LOVE the clothes she makes and her quirky style. My exciting news of the century is that she’s just interviewed me for her Stash Amnesty! series. So, if you want to know the ins and outs of why I took up sewing, what’s in my stash box and where I get my fabric from, head over there now and have a read. In other news – all my pattern pieces for my Swing Dress sewalong are now cut out, yippee. I didn’t have to make too many adjustments, which was a relief. I cut out a size 14 and it fitted pretty well. I just had to shorten the bodice front and bodice back by a small amount and shorten the skirt, all made easy peasy by the lengthen/shorten lines on the pattern. I also reduced the amount of ease on the sleeves as advised by Casey, which again, was pretty simple. So, pattern duly adjusted, I washed my fabric ready to cut it all out. A simple task, I smugly thought – or not as it turned out …. My fabric is a red wool crepe, which I washed on a wool wash as I’d heard it was prone to shrinkage. I put it out to dry, made a cup of tea, and was suddenly overcome by the most hideous smell. It was revolting – a cross between mothballs and wet, mangy dogs. Some quick detective work later and I realized it was coming from my fabric… OH NO!!!!! It absolutely stank the place out. Panic stricken, I was straight on the computer googling the problem. Apparently that’s what happens with wool crepe, it’s the wool content that exudes the delightful perfume. The advice was wait until it’s completely and utterly dry and as if by magic, the smell should disappear. As you know, I’m not the world’s most patient girl, so every twenty minutes I was upstairs, sniffing the fabric. I’m pleased to report though, that a few DAYS later, the smell had gone. Having had my doubts about wool crepe, I’m now perversely really desperate to make this dress with it, so I’ve cut the pattern from the fabric ready to start sewing tomorrow, but I’m slightly nervous. If the dress turns out well, I’d planned to wear it to my brother’s wedding in July. That’s why I chose wool crepe as it had more of a luxurious feel to it and could hold its own as befits a posh wedding outfit. But what if it rains?!! My brother is twelve years younger than me, and I’m already worried I’m going to be mistaken for ‘mother of the groom’ by some of his hip young gun-slinging friends, I don’t want to smell like an old dog to boot. I’ll just have to keep an eye on the weather forecast…. 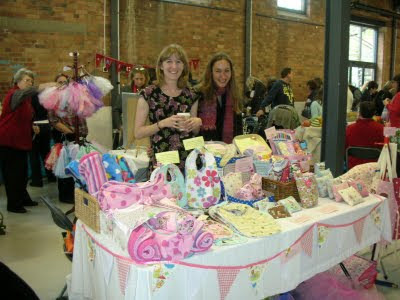 As some of you may know, I make a few crafted items (bags, purses, aprons, cushions etc) to sell at craft fairs. I quite like doing it but I've still got mixed feelings when it comes to craft fairs. 1) I like chatting to people about fabric and it's lovely to get compliments on what you've made. 2) It's extremely satisfying when somebody buys something you've handmade yourself. 3) It's nice to make some extra money. 1) It's a lot of work making enough items to make a stall look good. 2) It's also quite hard work lugging everything to the venue, packing, unpacking and selling all day. 3) I happen to be rubbish at selling, if I was on The Apprentice I'd be sacked in the first week. But at a craft fair before Christmas I had some good luck (which is a very roundabout way of telling you about my exciting craft news). Somebody saw my work and consequently got in touch with me. This lady sells other people's work but it's all hand picked, so everything she sells has a cohesive look. She also exhibits at a far broader reach of craft fairs, including county shows etc and actually make a living out of it. She wants to add a few new lines to her range and asked if I would be interested in making them for her! Yippee! An actual, proper order. She wants me to make Tooth Fairy Cushions! Now I've seen them on Folksy and a few other places but never actually made any myself. and zippered purses. This is my sample, whilst we decide which fabrics to use. Apparently it was the fabrics which drew her to my stall, so my online addiction has been worth it! This initial order will make me the same amount of money as exhibiting at two or three craft stalls. I'd far rather make things at home in my lovely sewing room, at my leisure, so for me it's perfect. She also happens to be lovely and we have very similar taste, so I think it will be good fun to work with her. Result! I finished my third sewalong today with the completion of the Pendrell blouse – yes! This was a great sewalong, run by Tasia at Sewaholic: fast paced, good, clear photos and tutorials and lots of great advice. There’s also a Sewtionary on Tasia’s blog where she unravels the mysteries of various tricky sewing techniques by means of step-by-step tutorials. It’s really useful stuff, if like me, you get a blank head full of cotton wool every single time a pattern calls for under stitching a facing to a neckline. I don’t know what’s wrong with me - I’ve done it countless times but still there’s an absolute vacuum in my brain every time it comes up! And so, on to the Pendrell … a little peach of a pattern, well designed and clear and a pleasure to follow and use (in the same way the Collette Patterns are). This would be a perfect first project for a beginner as it’s easy to sew together and there are no closures (zips, buttons etc), just a neckline bound with stretchy bias binding. It’s a loose, drapey fit but is given shape by the cunning use of princess seams right down the front and back of the blouse. I chose view B, but omitted the seam ruffle as too many ruffles make me feel like Dog Toby from Punch and Judy. 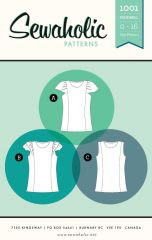 As I’ve mentioned before, Sewaholic patterns are designed for the pear-shaped figure. I’m curvy, but not pear-shaped so I sewed a bigger size than usual to accommodate by bust and waist and decreased the hip on the pattern to bring it more in proportion. I still had to take in the side seams at the bust and waist quite a bit, so I think for my next version I’ll try the next size down. The fabric was one of the Innocent Crush voiles from Anna Maria Horner. There was a lot of excitement from other bloggers over the summer about them and I can totally see what all the fuss was about. Ooh, what a lovely, buttery (Anna Maria Horner's word, not mine) feel this fabric has, and it’s so drapey. Because the Pendrell is cut quite long, it’s perfect for tucking in. As an experiment, I thought I’d try on my Sencha blouse and tuck it into my new 1940’s strides as the Pendrell looked so flattering. Crikey, what a difference in the feel and look of the fabric. In my naivety as a rookie seamstress, I used a medium weight quilting cotton for the Sencha. Having now sewn with voile, the quilting cotton feels like it’s been in a bath of starch for a week. It's so stiff, what was I thinking?! I still like it and will wear it again, but I’m afraid it will be forever afflicted with bad, stiff fabric syndrome. This is a great, versatile blouse which I'm sure I'll wear a lot over the coming months. As well as teaming with my fine slacks, it also looks good untucked with jeans. So, I’m now in the unusual position of only participating in one sewalong - Casey’s Swing Dress. 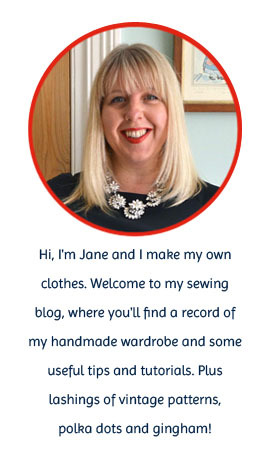 I’m planning to sew up my muslin tomorrow, but her post on how to sew up the complicated, gathered shoulder seam look terrifying, so maybe it’s a good thing I’ve only got that to concentrate on!